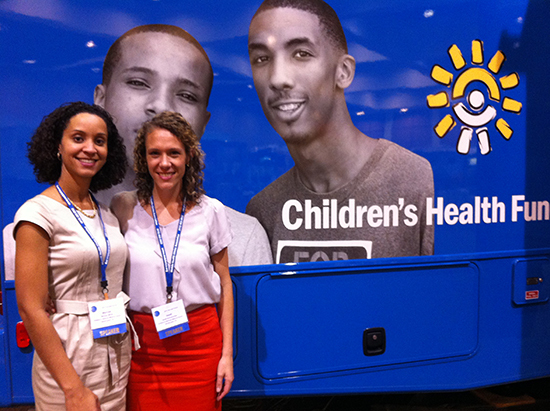 The Mobile Health Program of Children’s National Medical Center began two decades ago to increase access to primary care services for underserved children in DC. However, the MHU’s services have been underutilized while health outcomes remain poor in target neighborhoods. 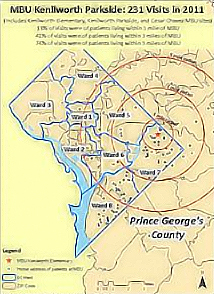 Dr. Heidi Schumacher, a member of the DC AAP chapter and chief pediatric resident at Children’s National, used a multi-modal research approach, including chart reviews, surveys, and focus groups to uncover which populations were using (or not using) the Mobile Health Unit and why, as well as attitudes and desires surrounding the medical home among those who lived in target neighborhoods. Her data showed that of 834 total visits in three target neighborhoods, only 13 – 42% of visits at each site were by patients who lived within one mile of the unit location. The overall show rate to visits was only 37%, with residents within proximity of the van showing slightly higher show rates. The locations of patients in relation to the van site in the Kenilworth/Parkside community are mapped here. Surveys and focus groups showed that the vast majority of patients and families utilizing the MHU were pleased with their care (75%) and would recommend the MHU to a friend (86%), but lack of clarity about types of services provided, insurance accepted, scheduling in an appointment-only system, and model of the medical home has limited the community’s ability to embrace the mobile unit. It is clear that enhanced communication, greater community engagement, and a more expansive view of how we schedule and advertise our services is necessary to fulfill our mission as the medical home of DC’s most vulnerable children.